I’m sure like us, many of you are starting the new year with a healthy eating goal! If you are looking for a low carb, vegan friendly, delicious dessert that is simple to make – we have a great simple ingredient recipe for you. That’s right, a simple ingredient ice cream recipe. Somehow the little fat that is in bananas create a fun trick when frozen and blended. This makes for a low fat and delicious treat. 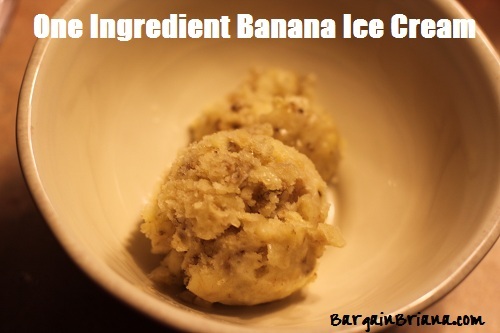 If you are like me and throw bananas in the freezer, you may already have some in the freezer! This is fine. Just make sure to cut into small pieces to make it more manageable in your blender. Peel bananas. Cut into small pieces. Blend until creamy. I used my Ninja Food Prep but any Blender should do the trick! Even my super picky kids enjoyed this healthy treat!